Given the scenario of waiting several days to obtain HIV or syphilis test results, scientists from Columbia University had developed a smartphone accessory that diagnoses sexually transmitted diseases within 15 minutes, notably HIV and syphilis. With just a little jab on your finger, the dongle can confirm if you’re infected with HIV or syphilis among other sexually transmitted infections. Having been tested in Rwanda where the rate of STDs for mother-to-child infection is pretty high, researchers say it worked perfectly; with the potential to even use it to diagnose STDs in any country of the world. And this means the dongle has the potential to be used in a manner that could transform diagnostic tests in developed nations like the United States and throughout the world. The smartphone dongle works almost like any conventional lab-based diagnostics for HIV antibodies and it also has two markers for syphilis – the treponemal-specific antibody and the non-treponemal antibody for active syphilis infection – in a single-test format. It does so by performing an enzyme-linked immunosorbent assay (ELISA), a traditional STD test, with all of the power being drawn from the smartphone. This device can also be used in places with little or no electricity. 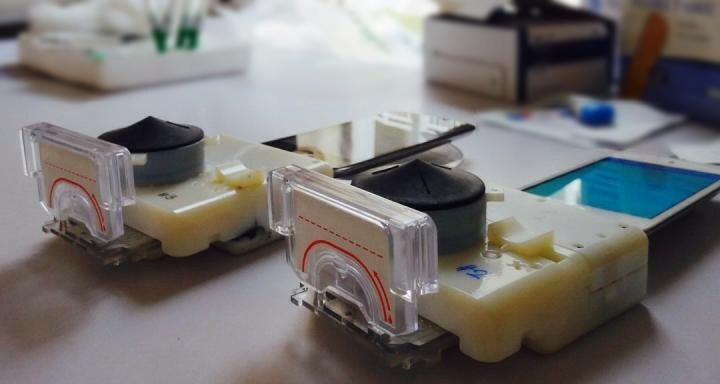 This smartphone accessory is great for testing for syphilis and HIV because they are two dangerous infections that could easily pass from mother to child, even in the womb – making the WHO to prioritize preventing their spread at all costs. According to the WHO, nearly 1.5 million pregnant women worldwide are infected with probable active syphilis every year; about half of them are untreated, which can lead to stillbirth, fetal loss and other devastating conditions. Published in the journal Science Translational Medicine, Sia and fellow researchers analyzed how they tested the HIV and syphilis status of 96 pregnant women in rwanda who were recruited by word of mouth and with consent at local clinics. Partnering with the local Ministry of Health, the Rwanda Biomedical Center, and the Institute of HIV Disease and Prevention and Control, among other groups, the researchers had created a separate software app to help train local healthcare workers on how to administer the mobile kit. “The device is very useful in our settings: cheap, easy and quick. At a large scale, it will save lives,” said Sabin Nsanzimana, division manager of HIV and STIs at the Rwanda Bio-Medical Center and the Ministry of Health, after tests were conducted in healthcare centers in Kigali, Rwanda, among other areas that have a high prevalence of HIV and syphilis. Researchers found the technology was 92 to 100 percent accurate for sensitivity, or tests that were true-positive, and 79 to 100 percent accurate for specificity, or tests that are true-negative. 97% of respondents said the test was good, and majority said the procedure was fast and easy. Privacy and data security concerns should never be an issue with this technology because according to Sia, the accessory itself is slightly larger than a USB dongle and plugs into the audio jack of a smartphone or tablet, but when a patient is tested, a memory chip is plugged into the dongle and that chip houses the test result – helping healthcare workers to accurately interpret the given data correctly and keeping it safe for future use. “I think all of those are legitimate concerns, but overall, with the right safeguards in mind, there will be more pros than cons to having blood tests available to people in more settings,” Sia said.